This violin (far left), in the Detlor's collection, is the only physical example known of Anderson's, though he undoubtedly made many more - including the "one armed" violin and a "Stradivarius"-like instrument which was allegedly sold for $200 around the turn of the previous century. My fellow researchers and I wondered if there are any unusual features about it, or if it is similar to either of the violins belonging to Knutsen's eldest daughter, Bertha, shown in the two family photographs above (see Historical Photos for the full photos). It's certainly likely that these instruments were built by Anderson, since we've learned that he supplied Knutsen with a certain amount of violins. "We talked to and showed the violin, as well as the photographs (of the two Knutsen family photographs and the "one armed" violin - GM), , to both Henry and Kenneth Bischofberger. 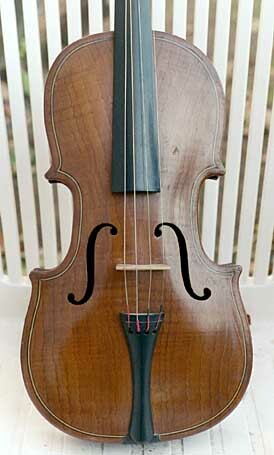 In regard to the violin, they both agreed with the assessment that was made a number of years ago at another violin shop - that the top of the violin is hardwood, and as a result it would not have good tone quality. We are now wondering, since both Otto and Knutsen should have been aware of this from their experience with guitars, if this violin was actually made as some type of a prototype model, rather than actually being made to be played. The one observation that they did make is that the F holes are somewhat closer together than they are in many violins. Other than this, placement is similar to many of the violins that they have in their shop. 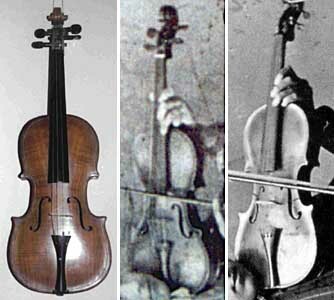 "In regard to the violins Bertha is playing in the photos, they said that it was difficult to tell anything much, although it appears that the one in the picture on the right might have a higher arch on the top than some violins - although this is not really very meaningful as to identification of the source. "In regard to the photo of the unusual (One Armed Violin - GM) violin, Henry commented that the instrument looks to have a shinier finish than most violins. This may be an indication that it was built by a cabinet maker, rather than a musical instrument maker, as furniture often has more of a shiny finish than is normal on instruments. Beyond this they were unable to provide any information concerning this instrument or the design, although they did state that a number of unusual designs for violins have been introduced over the years." "It's safe to say, based on the pictures, that the three violins are different. The top on #1 shows distinct figure/grain patterns which the others don't have. #2 has what looks like an ivory or bone nut. #2 has a very distinctly rounded lower corner on the treble side while #1 and #3 have more pointed corners. Finally, the f-hole spacing on 1 is quite close, while the others look more conventional." And finally, luthier Kerry Char finally got to examine and photograph the instrument. He believes the unusual top is made of figured cedar, with a back of Brazilian rosewood!